School: *I have some professional development meetings to attend and my kindergarten team will also be doing some team planning this summer! Personal: *Summer organizing - Definitely want to do some organzing around the house! *Exercise - Going to try to get on my treadmill more or walk in the evenings! *Read - I really want to make more time to read...any book suggestions???? *Blog Posts - I don't want to neglect my blog over the summer so I want to make sure I am still blogging! *TpT - I would love to get some new products in my TpT store this summer! Fun: *Vegas - Who else will I see there?!?! So excited! *Beach - Can't wait! *Day Trips - My husband and I love doing little day trips over the summer! *Fun with Family & Friends - Can't wait to spend time with family and friends! 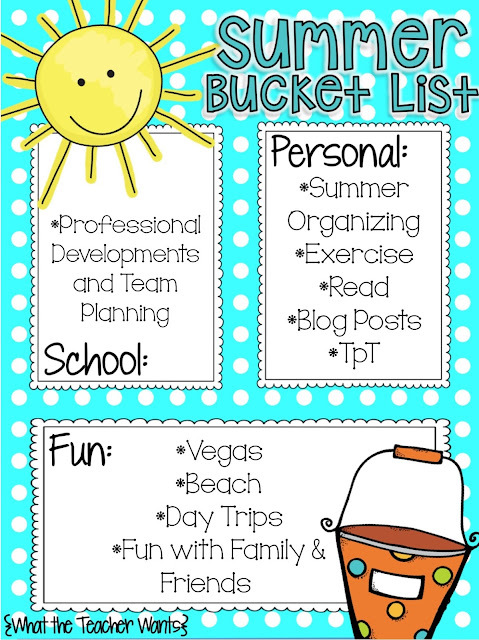 What is on your summer bucket list?!?! Link-up with What the Teacher Wants to share!